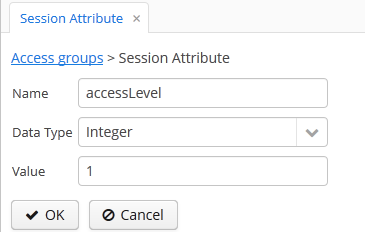 The access group can determine the session attribute list for the users in this group. These attributes can be used when setting the constraints. The availability of the session attributes can be checked in the application code at the development stage, so the final system behavior for particular user groups can be controlled at the operation stage. When logging in, all the attributes set for the user group and for all the groups up the hierarchy will be placed into the user session. If an attribute is found in several levels of the hierarchy, the uppermost group value will be used. Hence, overriding the attribute values at the lower levels of the hierarchy is not possible. In case of the override attempt, the WARN level message will be written to the server log. A unique attribute name, data type, and value must be specified.